That old Loadstar from yesterday was a nice looking truck but personally I like this one a little better. The Town of Verona is still rolling with this nicely preserved 2574. The black strip up near the hood ads at least 5 mph to the top speed. The clear lights on the tab of the cab are also interesting. I would almost suspect to find them on a fire truck of some sort. Perhaps this truck is in it’s second municipal life? The old style detachable goose neck trailer out back is a perfect companion to this old truck. 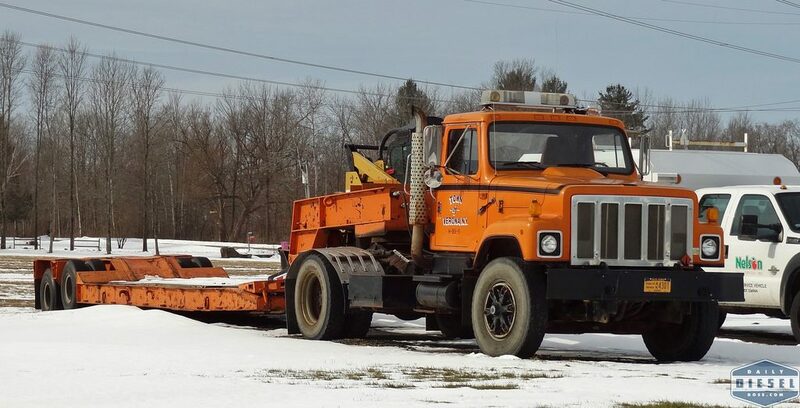 In fact, this would be a great setup to haul old trucks around to various shows. Keep an eye on those auction sites. I only got one decent shot from that place, photo ran a few weeks back, green GMC with plow.